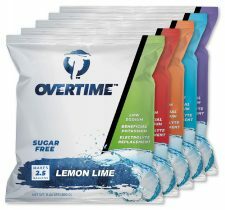 Overtime Electrolyte Replacement – Full of Taste, Not of Sugar. These easy-to-use pouches are perfect for crew-sized containers. Use in a 2.5 gallon jug or combine in larger 5 and 10 gallon coolers. Choose from 5 refreshing flavors that are full of taste, not of sugar. 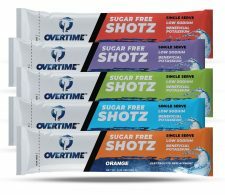 These convenient Single Serve Shotz provide an easy way for workers to stay hydrated when bottled water is readily available. Just mix with a 16.9 oz. bottle of water. Choose from 5 refreshing flavors that are full of taste, not of sugar. 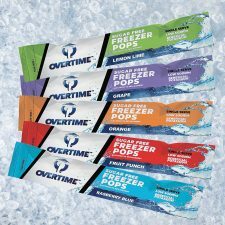 Freezer pops give workers a great way to beat the heat and stay cool, with 3 ounces of refreshing goodness in each serving. These great tasting, sugar-free electrolyte charged pops also help the entire crew stay hydrated. Choose from 5 refreshing flavors that are full of taste, not of sugar.